Welcome to Swiss chocolate artisanship at its best! 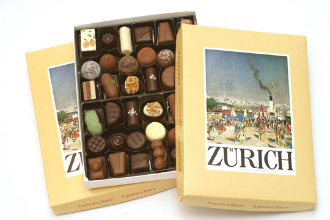 Featuring an antique postcard motif of historic Zurich, this box represents a broad sample of our product line. Some of our popular truffles are assorted with soft nut gianduja which is created by finely grinding hazelnuts (and/or almonds, walnuts)and mixing them with cocoa to create a subtle, velvety filling. There are pralines mixed in, which contain a fine chocolate filling with caramelized, crispy hazelnut and almond pieces inside. Further pieces feature smooth almond paste fillings, and fine nougat creations - something for everyone.